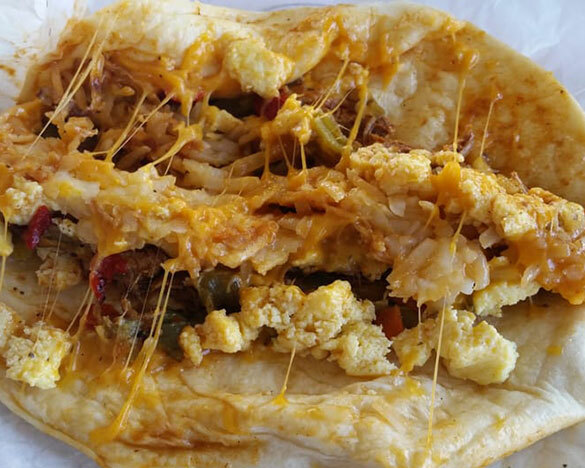 Cheese is a very important part of the burrito equation if you think about it. Certain regional variations of the burrito play more emphasis on the cheese component. Some take the cheese part so seriously that they actually give you many choices of cheese. In other renditions of the burrito as well as different regional variations of it, the cheese component is almost relegated to an afterthought. They think that the burrito requires some sort of cheese, but they really don’t put much thought into the cheese. So, which is correct? Which implies the role of cheese in a burrito? What if I told you that they’re both correct? It really boils down to your preference to burritos. Some people like so much cheese in their burritos that you’re basically just eating a rolled up inverted pizza. Seriously. It’s like a cheese pizza that’s been turned inside out and rolled at the ends. That’s what you’re eating. The same tastes are in play. There’s melted cheese. There’s tomato. The only difference is the rice and the beans and the cilantro and onions. However, if you are having a Mexican-style pizza and turn it inside out and roll the ends, you’d have this type of burrito. Its heavy emphasis on the cheese makes it taste similar to that of a rolled-up pizza. Of course, it’s not quite there yet because of the difference in texture, but you get my point. This is perfectly okay if you’re big on cheese. Other people are not really big on cheese, and they’re big on filling so they’d rather have more rice, more beans, and if there’s going to be cheese, it’s just going to be a slight thin line, just enough to let you know that it’s there. It doesn’t take the spotlight. It definitely doesn’t steal the show, but it’s just there. It’s kind of like a bit player. Imagine a conductor working with an orchestra, and somebody comes in with a clarinet on the side. That’s the role of cheese in minimalist-cheese preparations. It really runs the whole gamut, and this really highlights the beauty of the burrito because it can accommodate both extremes. You don’t have to bomb the hell out of your burrito as far as cheese is concerned for you to really wake up the taste because the great thing about the burrito that it really is the concert symphony of foods. There are just so many ingredients, all of them contributing in their little way. That’s what makes the burrito so amazing, so compelling and you can’t stop at one. I’m not saying this as some sort of general statement that applies to all people in all situations in all places at all times. Nobody can make such a statement. That’s too broad. However, if you’ve developed a liking for burritos, I wouldn’t be surprised if you go back again and again and again because each experience is different especially if you get burritos from many different places. That’s the beauty of the burrito, and that’s why the cheese issue is really a non-issue because it really boils down to the rendition that you are signing up for. Now, if you go to a place that is known for not putting much cheese in their burritos, you can always make a special request. You can say I’ll pay the extra cheese fee. Maybe it’s an extra dollar or $2, and they would put more cheese. The best way to do this, of course, is to consciously a specific type of cheese. Queso blanco is different from queso fresco which is different from Mexican-style cheeses like Monterey. Keep this in mind because the way the cheese melts is different as well as the taste. It’s not just the taste difference that you’re after. It’s also the texture of the cheese and how quickly or how long it takes to melt.